Therapeutic ultrasound is utilized by physical therapists to deliver a high frequency mechanical vibration to facilitate healing at a cellular level. Therapeutic ultrasound is often used by physiotherapists to reduce pain, increase circulation and increase mobility of soft tissues. Additionally, the application of ultrasound can be helpful in the reduction of inflammation, reducing pain and the healing of injuries and wounds. The ultrasound unit should include a generator unit, a programmer to control parameters and a transducer head. Ultrasound therapy causes mechanical vibrations, from high frequency sound waves, on skin and soft tissue via an aqueous medium. The transducer head converts power from the generator into acoustic power that can cause thermal or non-thermal effects . The parameters (frequency, duration and intensity) are set on the programme controller by the user. When setting these parameters, the user must consider the calculations for treatment duration, target tissue type and depth . The normal acute inflammatory response occurs after the initial clotting response with vasodilation and invasion of white blood cells to the area which in return, initiated repair. Within the white blood cells are mast cells which undergo degranulation and release histamine and other chemical mediators to form a coagulated gel in the injured area. When ultrasound is applied in this phase, it enhances the degranulation of mast cells resulting in the release of histamine and other mediators that attract fibroblasts and endothelial cells to the injured area. This will later result in the formation of collagen-containing vascular granulation tissue. Early intervention with ultrasound should result in an accelerated acute inflammatory phase, moving to a more quick entry into the proliferative phase and improving comfort of the patient in this phase. Application of Ultrasound to the peri-wound area stimulates the release of growth factors needed to regenerate epithelial cells, further protecting the body from infection and reinstate skin integrity. 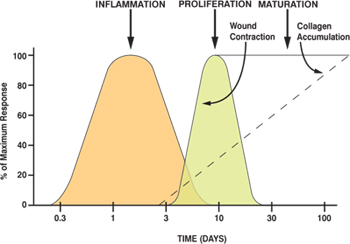 The response to ultrasound in this stage is dependent on if therapy was initiated in the inflammatory phase. Application of thermal ultrasound during this phase affects the collagen extensibility and enzyme activity and therefore also improves tensile strength of the healing tissue. 1MHz, continuous mode with intensity at 1 – 1.5 W/ cm squared. The aim is to produce a thermal effect for vasodilation and increased tissue oxygen levels. The ultrasound head should be 1.5 or 2 times the size of the area to be treated. Aqueous medium is applied to the transducer and is moved in a slow circular motion around the treated area. 2-3 minutes completes per zone, 3 times per week. 20% duty cycle, 3MHz with intensity at 0.3-0.5 W/cm squared. The aim is to stimulate protein synthesis and increase cell proliferation. The dressings should be removed and wound should be debrided of dressing residue and foreign debris. Apply a hydrogel sheet over the wound, removing any air bubbles. The ultrasound head should be 1.5 or 2 times the size of the treated area. If the area is large, treatment can be completed in sections with 1-2 minutes per zone. Ultrasound medium is applied to the transducer and in contact with the hydrogel sheet. Acute wounds can be treated 1-2 times per day and then continued 2-3 times per week. Ernst completed a systematic review of 5 studies that utilized ultrasound therapy for patients with leg ulcers and pressure sores. They used low-dose (low intensity) ultrasound which proved to be effective as an adjunct to promote wound healing. This has been also confirmed by other systematic reviews. Kavros, Miller and Hanna evaluated the role of noncontact low-intensity, low-frequency ultrasound in the treatment of a non-healing leg and foot ulcer with chronic limb ischemia. Ultrasound therapy was administered 3 times per week for 5 minutes, each treatment. Results showed an increase in the rate of healing when coupled with standard wound care. McKenzie, Wong, West and Hunt conducted a single-blinded, posttest experimental study to compare the differences in wound breaking strength and collagen deposition in pigs. The researchers surgically induces incisions in 48 pigs and for 5 to 10 days ultrasound was applied with either high –dose or low-dose ultrasound. High dose ultrasound parameters were 1.5 W/cmsquared, continuous mode, 1Mhz for 5 minutes and low-dose parameters were 0.5 W/cmsquared, pulsed mode, 20% duty cycle, 1MHz for 5minutes. Findings from the study revealed that ultrasound was beneficial in wound healing and stated that physical therapists can utilize high-dose ultrasound for about a week to enhance collagen deposition and wound strength. Low-dose ultrasound was suggested for treatment for two weeks or more. ↑ 1.0 1.1 1.2 Schönenberger K. Ultrasound therapeutic device. J Acoust Soc Am. 2005;118(2):600. ↑ 2.0 2.1 2.2 2.3 2.4 2.5 2.6 Sussman C, Bates-Jensen B. Wound care :A collaborative practice for manual health professionals. Philadelphia: Wolters Kluwer/Lippincott Williams & Wilkins Health; 2012. ↑ Ernst E. Ultrasound for cutaneous wound healing phlebology 2008;10(1): 2-4. ↑ 6.0 6.1 6.2 6.3 Byl N, McKenzie A, Wong T, West J, Hunt T. Incisional Wound Healing: A Controlled Study of Low and High Dose Ultrasound. J Orthop Sports Phys Ther. 1993;18(5):619-628. 7. Baker K, Robertson V, Duck F. A Review of Therapeutic Ultrasound. Journal of Womenʼs Health Physical Therapy. 2010;34(3):111-118.